Greek Orthodox Community of Melbourne and Victoria - We speak Greek in March in 2016! 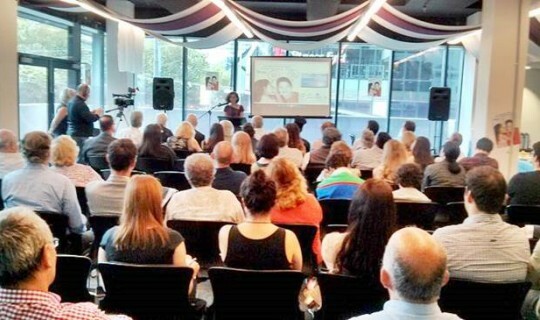 The huge international success of the inaugural Speak Greek in March Campaign that was initiated last year in Australia is repeated with an even greater effort this year. The campaign aims to encourage and to give opportunities to hellenophiles and speakers of Greek to use the Greek language as much as possible in their everyday lives. The Greek language which, first of all, forty centuries ago, helped the human spirit to express itself and has since then been widely used throughout the western world and civilisation, plays a vital role in the way we think, express ourselves and communicate. The Speak Greek in March campaign has been adopted by other Greek speaking communities outside of Australia and we are confident that the campaign will continue to impact on the maintenance, spread and sustainability of our priceless and invaluable language in the diaspora.